P, Q, R, S, T, U and V are sitting along a circle and facing at the centre. P is between T and S.
U is between. Q and V.
Q is 2nd to the right of T.
What is the position of R? Which of the following pair has its first member sitting second to the right of the second member ? P, Q, R, S, T, U and V are sitting along a circle facing the centre. P is between V and S.
R, who is 2nd to the right of S is between Q and U. ‘Q’ is not the neighbour of T.
Which of the following is CORRECT statement ? What is the position of T? Who is between R and U? Which of the following is wrong statement? Which of the following pairs has 2nd member sitting to the immediate right of the first member? Directions (Q. 11-15): Eight executives J, K, L, M, N, O, P and Q are sitting around a circular table for a meeting. 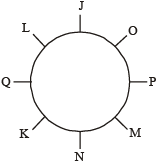 J is second to the right of P who is third to the right of K. M is second to the left of O who sits between P and J. L is not a neighbour of K or N.
Who is to the immediate left of L? Who is to the immediate left of K? Which of the following is the correct position of N? Who is third to the right of P ? Which of the following groups of persons have the first person sitting between the other two? Directions (Q.16-20): Eight friends J, K, L, M, N, O, P and Q are sitting around a circle facing the centre. J is not the neighbour of N. L is third to the right of K. Q is second to the left of N who is next to the right of L. O is not the neighbour of N or K and is to the immediate left of P.
Which of the following is the correct position of L? Which of the following pair of persons represent O’s neighbours? Which of the following groups has the first person sitting between the other two persons? Who is to the immediate right of K? Who is to the immediate left of O? Directions (Qs.21-25): A, B, C, D, E, F, G and H are sitting around a circle facing at the centre. D is second to the left of F and third to the right of H. A is second to the right of F and an immediate neighbour of H. C is second to the right of B and F is third to the right of B. G is not an immediate neighbour of F.
Who is to the immediate left of A? In which of the following pairs is the first person sitting to the immediate left of the second person ? Who is fourth to the right of B ? What is E’s position with respect to G? Directions (26-30) : P, Q, R, S, T, V, W, Y and Z are sitting around a circle facing the center. V is second to the left of P who is third to the left of Y. S is fourth to the left of P. T is third to the right of Q who is to the immediate right of V. W is fourth to the right of Z. Who is third to the left of S ? In which of the following pairs is the first person sitting to the immediate right of the second person? In which of the following combinations is the first person sitting in between the second and the third persons? Who is third to the right of W? Who is second to the right of Z? Directions (31-35) : A, B, C, D, E, F, G, H and K are sitting around a circle facing the center. F is fourth to the right of A who is third to the right of B. K is fourth to the left of B and third to the right of D. C is third to the right of H. E is second to the left of G.
Who is to the immediate right of F? Who is third to the right of K? What is E’s Positions with respect ot B? Who is fourth to the left of G? In which of the following combinations is the third person sitting between the first and the second persons? Directions (36-40) : V, U and T are seated in a circle facing the centre. A, B and C are also seated in the same circle but two of them are not facing the centre (facing opposite direction of the centre). V is second to the left of C. U is second to the right of A. B is third to the left of T. C is second to the right of T. A is seated next to V.
Which of the following are not facing the centre ? B and C are not facing the centre. They are facing opposite direction of the centre. Which of the following is T’s position with respect to B ? Which of the following is V’s position with respect to C ? Which of the following is true regarding the seating arrangement ? Which of the following is A’s position with respect to U ? Directions (41-45) : A, B, C, D, E, F, G and H are sitting around a circular table facing the centre. No two males or two females are immediate neighbours of each other. A is wife of H. A sits third to the left of E. F sits second to the right of D. D is not an immediate neighbour of A or E. H and C are immediate neighbours of each other. F is not an immediate neighbour of his wife B. Which of the following is true about G ? How many people sit between B and F when counted in anti-clockwise direction from B ? Which of the following groups consists of only female members of the group ? If all the persons are made to sit in alphabetical order in clockwise direction, starting from A, the positions of how many (excluding A) will remain unchanged as compared to their original seating positions ? Directions (46-50) : At a party, A, B, C, D and E are sitting in a circle. The group comprises a professor, an industrialist and a businessman. The businessman is sitting in between the industrialist and his wife D. A, the professor is married to E, who is the sister of B. The industrialist is seated to the right of C. Both the ladies are unemployed. What is A to B ? The given information can be summarized as follows. A is the husband of E and E is the sister of B. Hence, A is the brother-in-law of B. It cannot be determined, as no information has been provided in the paragraph about the sitting position of A. Who is the industrialist ? As deduced earlier, B is the industrialist. Who in the group is unmarried? It cannot be determined whether the businessman is married or unmarried. Who among them must be graduate ? As A is a professor, he must be a graduate.